The Three Musketeers has the potential to be an extreme two and a half hour bore, it’s not a particularly interesting story to begin with, and especially after the disaster that was the 2011 film, it’s a dangerous choice. However, thanks to Hattie Naylor’s genius gender-swapping script, director Sarah Punshon’s creative eye for detail and a fabulous cast, The Dukes’ adaptation of The Three Musketeers is truly magical. After having attended a few promenade productions before, I was intrigued to see how The Dukes would adapt this format to a family show. The “play in the park” is hailed as an annual tradition in Lancaster, and I can see why. 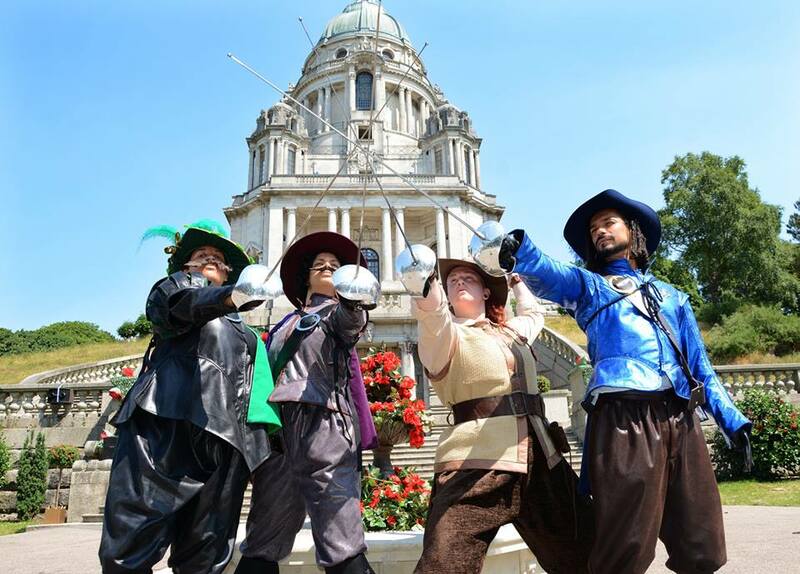 Williamson Park plays a gorgeous backdrop to the proceedings and especially in the summer weather, you feel fully immersed in the action. In this production, The Ashton Memorial is especially prominent and brings the French monarchical setting to life, which ends in a magical climax in the final scene at the Orange Ball. I also particularly enjoyed the use of the woodland for a scene, as the sun was setting, it was genuinely mysterious and created a tense action sequence. Every member of the cast is impeccable and largely unknown to the audience, most of them play multiple characters, in which they effortlessly transform between with remarkably quick costume changes! Drag King lead, Lucy Parkinson, is a casting that’s been written in the stars. Her charisma carries the production from start to finish, and Lucy herself embodies the message of social equality and what it means to be an actor in 2018. The comedy in The Three Musketeers is very strong, and sparks laughter from both adults and the family audiences. Delme Thomas is a phenomenal talent, and my highlight by far. He plays a ridiculously camp, eyebrow-conscious King Louis and it makes for a hilarious comedy creation, paired with his beautifully extravagant costume and mirror. Even the characters that are traditionally envisioned as more “serious”, like evil spy Milady, have a tongue-in-cheek edge to their characters that brings them into the 21st century, rather playing completely safe with what Alexandre Dumas would have intended. And finally, I couldn’t not mention Christopher Bianchi’s Planchet the horse- it is something else, but I won’t spoil the magic of it for people who haven’t yet seen it. The Dukes continue their fantastic service to the community with the inclusion of the community cast, encompassing a fully diverse selection of members. Although it is unfortunately in the community cast that my one little criticism lies. They appear as market sellers interacting with the audience, to strengthen the Parisian atmosphere, and some of the community cast attempt a French accent. Yet most of the younger cast disjointedly maintain their own accents, and I personally saw some of the magic lost with a seemingly-precocious girl shouting “pomme de terre” in my face with a Northern accent. 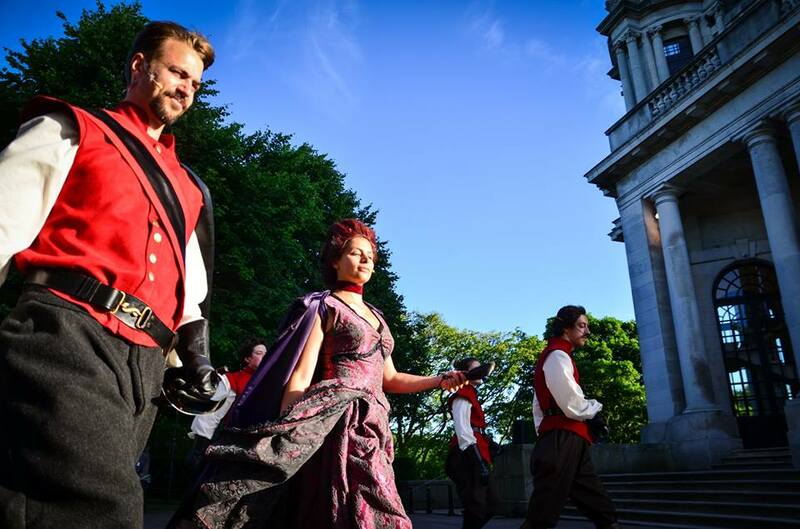 Overall, The Three Musketeers shows The Dukes to be a torchbearer of contemporary theatre. They display how a family show can be transformed into something that interweaves enormous amounts of stagecraft into every element, and manages to encompass a daring social message concerning gender and sexuality that is mostly still avoided in family theatre. This is a production that you cannot miss. Previous articleTasty Vegan Baking Treats!